If you want to be close to town and live in a larger home, then make sure you include Highgrove among your list of neighborhoods in Tallahassee to view. With homes from 2,000 square feet to over 5,000 square feet and mostly built in the 1980s or early '90s, Highgrove was the pinnacle of executive living in Tallahassee during its infancy. Today, it represents several things for potential buyers. First of all, the location is a premium. Located on the Western side of Thomasville Road, it provides quick and easy access to midtown and downtown Tallahassee. Secondly, larger homes like you'll find in Highgrove would take several hundred thousand dollars more to produce today then you'll have to spend now, so value is also drawing buyers here. Finally, the style of homes is pure Tallahassee, with mostly brick homes nestled in well manicured and landscaped yards. It is important to note that the narrative contained below is for sales through December for all previous years, but through the second week of March in 2016. The graphs and the closed sales table will be continuously updated into the future (meaning bookmark this page if you always want to know the current status of homes for sale in Highgrove). 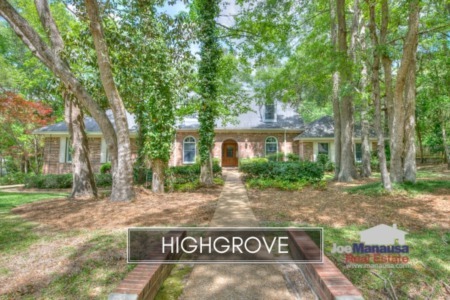 There were 8 homes sold in Highgrove last year, with an average sales price of $462,500. Through the second week of March in 2016, only one home has sold and closed and it sold for $324,900. 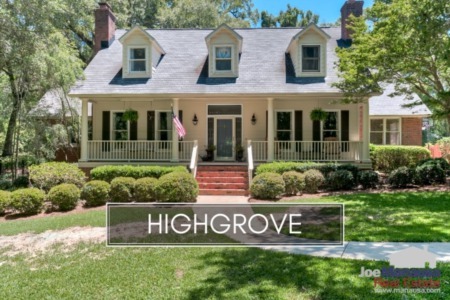 With four homes on the market and two already under contract, Highgrove appears to be setting up for another good year. The pace of home sales in Highgrove back in the 1990s equated to about 12 homes sold per year, and with the previous two years sport 9 and 8 sales respectively, we should assume there is a little pent-up supply among existing homeowners in Highgrove. This is not a big shock, as this situation exists in most neighborhoods in town. There was a small dip in home values last year, but with fewer than 10 sales per year, this could just be "noise" in the data. Home values in Highgrove really haven't changed much since 2010. Through this writing, the average value of a home sold in Highgrove over the past year has been $120 per square foot. The average home size sold in Highgrove typically falls in a range of 3,000 to 3,600 square feet, but sales in 2015 shot above the higher end of this range. The 8 home sales in 2015 averaged 3,739 square feet, while the one home sale this year came in below the smaller end of the range at 2,703 square feet. With time and a few more closed home sales, I suspect we'll see Highgrove return to historical norms. The following list of homes are the most recent listings in Highgrove. The following list shows home sales in Highgrove going back to 1991. I hope you enjoyed our March 2016 update on home sales in Highgrove, please feel free to drop me a note if you need a real estate broker or are considering selling your home.